Being secure with your decision as to where you have placed your child for daycare means all the difference in your day-to-day productivity. If you have the peace of mind knowing that your child will be fed, diapered, held, cuddled and loved, you can truly relax and concentrate on your daily responsibilities. At first your decision to choose a daycare provider for your child may bring up many feelings – from uncertainty to guilt. These are very common especially with first time parents and certainly feelings that all parents share. Because of this very big step you are about to make we are sure you are checking out other sites and visiting several schools, as you should. We are thrilled that you are considering Precious Moments to love, care and nurture your child in an atmosphere that is your child’s home away from home! We are here for YOU! We are very sensitive to the needs of parents with working schedules that keep changing or rotate from week to week. We can accommodate any schedule that you need for your child. We take tremendous pride in having such a wonderful staff that will care for your child as if they were your their own child. 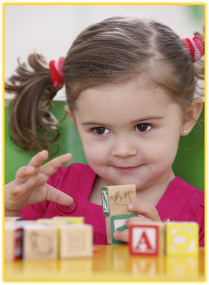 Your child will learn shapes, colors, and numbers. There will be crafts and special projects, play time in our indoor and outdoor (Maspeth location only) playground. They have access to a room fully outfitted with a block area, dramatic play area, math/manipulative area, library, circle time, art, sand and water, listening center and technology center! Yes, iPads and computers for toddlers! They will be working on gross motor skills, creativity and individuality as well as building their developmental skills. Collectively this will help them build a love of learning and that is the key to their educational foundation.